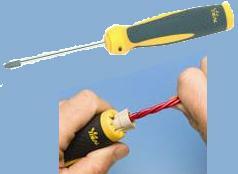 This new design of screw driver is designed for professional electricians. It has a fixed steel shank and is available in flat blade or Phillips head. Built into the end of the handle is the patent pending Accu-Loop wire looping system which is a wire connector wrench that make it much easier to twist electrical wires together when making connections, thus significantly speeding up installation of electrical fixtures, receptacles, and switches. The wrench will handle wires up to12 gauge. All the user has to do is insert the wires into the handle, turn the handle, and they get a perfect loop. The ergonomically shaped handle has a soft Santoprene grip covering a hard high visibility molded handle to improve comfort of grip. This looks like it may be a great tool for anyone with carpal tunnel syndrome, tendonitis, or other types of hand and arm injuries who need to make a lot of electrical connections. This product is made by IDEAL Industries, and suggested retail price is $9.47. Go to http://www.idealindustries.com/ for details. Scientists at The University of Arizona have developed new switchable, flat, liquid crystal diffractive lenses that can adaptively change their focusing power. This development opens the way for next-generation "smart" eyeglasses -- glasses with built-in automatic focus. In the foreseeable future, for example, you won't change prescription eyeglasses -- your eye doctor will just tweak a new prescription into the specs you already own. 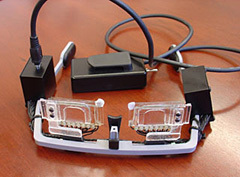 You could even program your glasses for better than 20-20 vision. "Right now, in our prototype, you switch the lenses on or off to change focus," said Nasser Peyghambarian, chair of photonics and lasers in UA's College of Optical Sciences and professor of optical sciences, materials science, and engineering. "But ultimately this will act just like your automatic camera: eyeglass lenses will know where to focus just like your auto-focusing camera does." Auto focus liquid crystak eyeglass prototype. 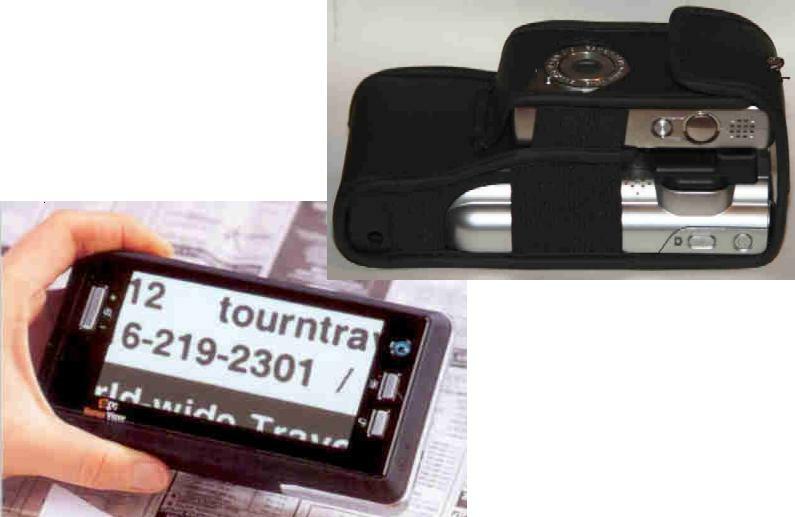 This handheld reader uses a 5 megapixel Canon digital camera and a Dell Axim PDA loaded with OCR and Text to Speech Software to image and convert hard copy text into speech for people who are blind. It is still in Beta Testing, but I can't wait to see this thing in action. It is expected to only cost $3000.